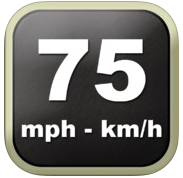 As far as bad apps go, the free app by Tim O’s Studios, Speedometer», is up there. It tries to utilize your GPS location to display your speed. It is possible to create a speedometer that uses the built-in accelerometer, but admittedly, these GPS ones are much more abundant and easier to engineer, although they provide less privacy. The problems with this app, however, do not stem from its design. This speedometer simply does not work at slow speeds. Sure, at high-velocity journeys may be a bit functional, but at slower speeds it lags and is unresponsive to the point that it’s not worth keeping around on your device. The screen is plastered with advertisements, which can obviously be removed for a fee, and the settings section of this app is more or less empty. You can switch between units (mph, km/h, knots), which would be quite nice if the speedometer actually worked! If you’re looking for a speedometer app, look elsewhere, because this one simply is not worth the download time and data charges. 2/10.